World-class flooring at hometown prices. We are Wichita's original POOPER SCOOPER Company. Commercial and Residential affordable concrete services for Wichita and surrounding areas. Our services include sealcoating, crack sealing, asphalt paving, pothole repair, large crack repair, striping, and concrete construction and repair. Providing commercial and residential fencing solutions in Wichita and surrounding areas. Specializing in tree removal, emergency tree services, pruning, trimming, stump removal and more throughout the entire state of Kansas. The largest used appliances showroom in Wichita, featuring popular brands like, LG, GE, Whirlpool, Kenmore, and Maytag. 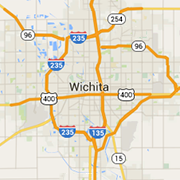 Your Complete Home improvement and Remodeling professionals for the Wichita Area since 1980. Providing drainage, dirt leveling, bank stabilization, dirt delivery and erosion control services to the Wichita area. Farha's Carpet & Building Supply, Inc.
Wichita's resource for remodeling and building. Carpet, cabinets, countertops, flooring and more. Open to homeowners and professional contractors. A Wichita-area general contractor specializing in custom residential and commercial renovations and additions. Offering residential and commercial garage doors and openers, as well as service and repair.